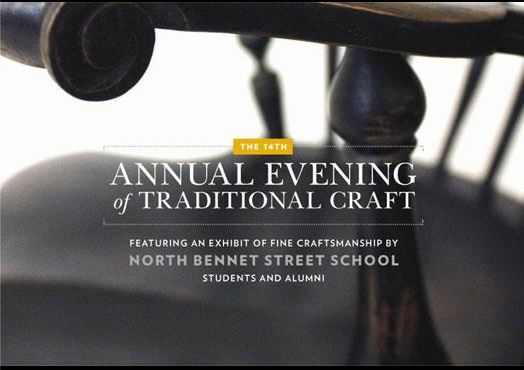 An evening we always look forward to attending and supporting is North Bennet Street School's Annual Evening of Traditional Craft. This fundraising event revolves around an exhibit of the wonderful craftsmanship of NBSS' students and graduates. KR+H's Alan Haigh went with his wife Alison Smith and met up with old friends and customers. Paul [Reidt] told me that he and KR+H's Karla Monkevich "went right into some satisfying conversations with fellow attendees. Carla and Mark Hutker, Allison Iantosca, and John Tittmann kept us talking for much of the night. We left feeling fully conversed." The exceptional craftsmanship of North Bennet Street School's students and alumni provides a rich environment for enjoyable conversation. The exhibit remains on view at Two International Place in Boston until May 30. 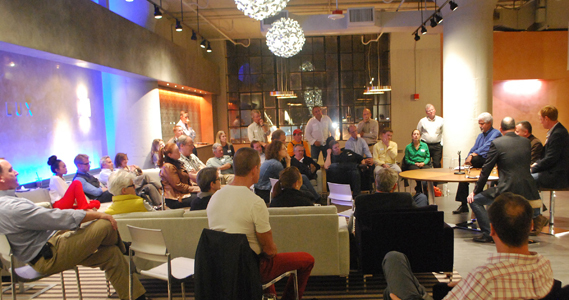 Our builder/architect/designer community gathered on March 27 for the third B/A/D Talks. It was a friendly, relaxed gathering exploring fresh, inspiring ideas around the evening's topic of Style: Connection or Constraint. Kyle Hoepner, editor-in-chief of New England Home, once again displayed his super talent as moderator, engaging both audience and panelists throughout the discussion. The speakers' last minute review of the talk before presentation. We want to share with you ideas given in this evening's talk. It's just a sampling of the generosity of our speakers as they offer their knowledge and their experience and their passion for their work. "...if [clients] want a high performance house in terms of function and design they tend towards the modern house., which is the great objective." "On the other hand if they value creating a stronger connection to their community in terms of cultural and social connection they tend to go traditional." "These things are very important. They're not mutually exclusive. And most of our clients want a combination of both of those things. That results in hybrid architecture...So hybrid houses arise from a strong respect for cultural and historic continuity coupled with objectives that lie well beyond the limits set by tradition. They're innovative but they're comfortable and familiar, while pushing the technical and cultural envelope. "But very importantly a hybrid is not an ad hoc combination of traditional and modern. It's a synthesis of highly successful and valued design elements. They're expressions of continuity in concert with evolution." "We talked about words and 'transitional' kept coming up. We never actually use that word in our office...We use 'eclectic.' And that's kind of what we do - we like to mix periods, styles, origins. Our 'transitional' work is some of our best work. And I think that's probably what we find the most enjoyment in." Kris Horiuchi, landscape architect / Horiuchi Solien, Inc.
"So I think in our work...It's about wrapping you into a story that engages your spirit and tugs at your memory. It's about the birthday parties and the quiet moments that we share. And in the end style I think is less about what is traditional and modern and more about your grandmother's white peonies." "I think there's a difference in style and individuality - the notion that 'style' is something that's familiar but not formulaic. I think that when it becomes that, that's when we get trapped, that's when we get constrained, that's when the individuality that you're talking about, you know is lost. 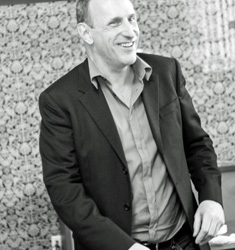 And I think when you loose that connection, you know, either it's not very fulfilling for us intellectually as designers - and certainly I think our clients are not as engaged, their not participating as much, they don't hold and cherish these things as much." "Given that all three of you [Marcus, Jim, and Kris] have said here tonight that you prefer working when possible in either a transitional or - kind of how ever you want to put it - sort of an eclectic style - I would suggest just from what we've done at the magazine [New England Home] that that kind of eclecticism and this kind of interpenetration of all these different eras and geographic influences and everything may end up being one of the defining stylistic characteristics of our time when people look back on it." l to r: B/A/D Talks speakers Kyle Hoepner, Kris Horiuchi, Jim Gauthier, and Marcus Gleysteen. "...pay attention to six things, and they're not original to me, and these aren't in any particular order:"
Most importantly: Pursuing beauty and delight. I feel very strongly if you do that style is irrelevant because you're going to end up where you need to be. "I can only add scale to that. Constant thing we're thinking about is scale, but otherwise I think what Marcus said is constant in design work. Those elements have to be there. Function: huge. Function has to come first...The beauty of something to us - it's adding that unexpected thing, it's making you smile or making you just have a good feeling. It's about creating something that's lasting and timeless and that kind of transcends any sort of 'trend.' We don't use the word 'trend.' We don't use the word 'trend' in our office hardly, if ever, because we don't do trendy work. "The [title] of this conversation was "Style: Connection or Constraint." Style becomes a constraint when it prevents you from taking full advantage of all the opportunites that surround you...I've mentioned before about client's wanting 10 foot by 10 foot lift and slide [windows and doors] that open up to the universe where they can commune with nature flawlessly. That to me is taking advantage of technology." "They're going to look back at us a hundred years from now and say, 'Oh, this is when they really started to think about taking care of the earth and doing things more sustainable, and thinking green.' That's to me the trend that we're experiencing now the strongest. It's not about a color, a fabric, a material; it's about the whole concept. Style just goes right along with that, and I agree with Marcus that we just kind of use that and it's a great stepping stone to help us get to better environments that we're all living in." "I think as a landscape architect - the nature of what we do - there's an ethic. And sustainability and thinking about being wise - that's just a part of what we do intuitively. I agree with you [fellow panelists] there's always the introduction of elements, of new things, and again I like to step back and say, 'Is it purposeful? How do we use this? How do we craft it well?' All the things that go into how the other people of the past approached technology or new things, we try to do now. Hopefully they're not aberrations, but yet they're woven into our work seamlessly." Good food, good drink, good company at B/A/D Talks. You can watch the video of this talk at www.badtalks.com. Event photos by Anastasia Sierra. This year, North Bennet Street School's Evening of Traditional Craft was held Tuesday, May 14, at Two International Place. It's a really wonderful, well-attended annual event and we were pleased to be a patron this year as in past years. Not only can you view the exceptional work by students and graduates of North Bennet Street School but also meet the artisans, ask them questions, and find out about their craftsmanship. We also enjoy saying hello to homeowners we've worked with as well as professional colleagues. As Finley Perry, F. H. Perry Builders, said to us, "It's been fun finding more and more industry friends involved with the School. I think there's an important mission there." Aliza Reidt, Paul Reidt are in the first photo. The middle photo is Paul talking with Eric Hill of Booth Hill Construction. And last is a photo of Aliza and Paul with Allison (Haigh). Congratulations to all involved in bringing about this truly worthwhile event!